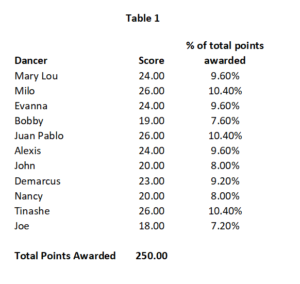 Pure Dancing with the Stars » DWTS Season 27, Week THREE – Dancing by the Numbers! DWTS Season 27, Week THREE – Dancing by the Numbers! Okay, so DBTN is a bit different going forward. Since the eliminations are now going to be last weeks votes and this coming weeks scores, that means that it’s much more “guessing” than it was before. We have to assume that most of the couples are going to score similarly to what they did this past week. And a lot of the time that’s not too far off base. But one thing I always wonder about with a set up like this is…if Len, at least, knows who’s going home, will he score them HIGHER or the SAME as he did last week. Or lower, to make him look prescient?? I guess we won’t know until the end of the season. Based on last week’s scores, we have who you might expect at the top of the leaderboard: Milo, Juan Pablo and Tinashe. I personally think that DeMarcus should be up there with them – anyone else notice how many footballers have been consistently under scored for weeks in years past?? I sure do. In any case, I doubt he’s in any danger. If Milo, Juan Pablo and Tinashe score similarly to what they did last week, they will also likely be safe. Conversely, Joe and Bobby are at the bottom of the leaderboard and if there was a dancing god, one of them would be going home this week. And it might not be Joe that goes. As you can see, Joe only needs 4k (and 1) more votes per million votes cast to stay over Bobby. And since Bobby is MUCH more annoying than Joe, well…but sadly, it’s most memorable year week and I would wager that everyone EXCEPT Joe gets a higher score. Regardless of how well Joe dances. Joe also only needs 8k more than Nancy and John – unless they seriously up their game, either one could be in real danger. Now, if everyone stays relatively the same, score-wise, I’m betting that Joe beats at least ONE of Bobby, Nancy or John. The only other person he *might* get past, is Alexis, just due to her lack of fanbase – but he would need 24,000 more votes per million votes cast to do it. Kinda doubtful. What about Bobby? Bobby only needs 4k more votes per million votes cast than either Nancy or John in order to stay. This is a tough call because if Nancy were dancing with anyone other than Val, I would say she’s history. But then again, if Val were all that, he would not have been in the bottom five with a TV icon type person. Since John and Nancy have the exact same score, John only needs one more vote per million in order to stay over her – which makes me think he is also safe. Really, it comes down to Joe, Bobby, Nancy with an outside shot of Alexis (I do think either she or Mary Lou or both are going to be “shocking” eliminations – but perhaps not yet). I feel like Joe and Bobby could beat Nancy and John with Nancy and John having almost no shot of beating anyone above them, because…. Yeah, do you see either of them getting those kind of votes to beat anyone above them?? I don’t think they can even beat Alexis (yet). Essentially it is down to Joe, Bobby, Nancy and John. I think John beats Nancy by that one point and Joe beats Bobby. That leaves us with Bobby and Nancy. Bobby or Nancy. Nancy or Bobby. Unfortunately, I think Nancy is too quiet and gets lost in the shuffle. I’m leaning toward Bobby being safe, but I would not be at all surprised to see him eliminated either. So, I’m guessing Nancy. During the live blog, I will try to include updates with regard to the actual scores they are getting and how that impacts what I’ve said here. I’ve had to do that before and it’s hard, but we’ll give it a shot. 5 responses to "DWTS Season 27, Week THREE – Dancing by the Numbers!" If there is a Dancing God there would be a surprise double elimination tonight and both Joe & Bobby go home. I feel for both Sharna and Jenna (I’m not even a Jenna fan) for putting up with these two – one would rather have a root canal than be on the show and the other one is just plain irritating IMO. Thank you Miss Heidi for your numbers as usual. I really hope Nancy has enough “juice” to stick around another week and send one of the aforementioned gentlemen home!! @Carrie that double elim of Joe and Bobby would be the most delightful turn of events. I really just can’t stand Joe and Jenna at all. Ugh! As for Bobby and Sharna, I feel for Sharna and hopefully gets a contender next season for the mbt. I’d rather have Nancy safe honestly. If she survives tonight I’m gonna create an account just to throw her some votes. I think Season 27 is a big disappointment. Derek, Maks, Karina and Peta aren’t on. Some wrong couples were eliminated. They were doing the same things they were doing for many seasons. This message comes from Steven Lantz of Brooklyn, N.Y.